This content is sponsored by Thomson Reuters. Time tracking and client invoicing are necessary functions for nearly all law practices – at least for those wanting to get paid. Unfortunately, firms generally cannot bill clients for the time spent on these tasks. As such, it makes sense for firms to spend as little time as possible on time and billing – while simultaneously making sure that these things nevertheless get done easily and accurately. That’s where Firm Central Time & Billing comes in: It offers a superior platform for expense tracking and invoicing, while also providing a variety of time-saving features to make sure that you aren’t wasting unnecessary time. Below are five of the top time-saving features of Firm Central Time & Billing. When entering time or expenses into a client’s invoice, it’s important to ensure that these charges are linked to the correct client matter. That much is obvious, of course, but this isn’t simply to make certain that charges are sent to the appropriate client. Many of the different client matters handled by your firm are on different payment rates and terms – and these exact terms are needed when composing an invoice. Firm Central Time & Billing is connected to the platform’s client matters function so that all the information about a client’s hourly rate and payment terms is automatically loaded whenever an expense item is entered. In addition, Firm Central’s ability to tie individual client trust accounts into Time & Billing makes it easier to track trust balances. Finally, Time & Billing’s integration into the larger Firm Central platform itself allows users to save untold time by having instant access to client-specific time logs, documents, and calendars – so that you know exactly what should be on a client’s invoice. Firm Central Time & Billing’s built-in timer is certainly a useful feature, acting as a stopwatch – or even multiple stopwatches running simultaneously – that let users measure how much time is spent on a specific client activity. As useful as it may be, it also saves you quite a bit of time. When figuring out how long you’ve spent on a specific task, how much time do you spend just trying to calculate how much time you’ve spent on that task? Probably not much for an individual instance, but certainly more than you would with two mouse clicks or screen taps. And that’s just with a single block of time. What about if a task for a client matter takes several blocks of time over the course of days or weeks? Or if there are one or more interruptions during one of these time periods? The computation of each of these blocks can be a very inefficient use of your time – especially when compared to a timer that can track these times with ease. Furthermore, Time & Billing allows users to add notes to each timer instance identifying the client and matter associated with the instance, along with any additional notes about it, such that it can be quickly and easily added into an invoice. Technically, Firm Central’s client portal feature isn’t exclusive to Time & Billing, but it can be especially helpful in saving time when dealing with client invoicing. For those unfamiliar with it, the client portal feature is a secure platform to communication and share information and documents with clients. Using it in a Time & Billing context allows you to securely send an invoice to a client, along with answer any questions that he or she may have about it. If you’ve integrated the client portal feature into your workflow, hopefully your client should already be accustomed to using the platform and will know how to access the portal, download any documents you’ve provided, and communicate about it if necessary. 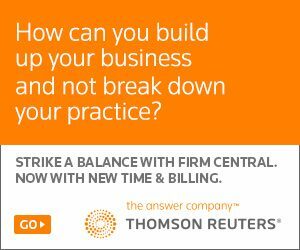 If this is the case, your time-savings will come from how quickly invoices can be shared with your clients, and the lack of interruptions that come from clients generally funneling their questions about their invoice into the centralized messaging hub of Firm Central’s client portal – rather than through phone calls. Taking the time to set up a Firm Central mobile shortcut is well worth the effort. The short-cut , available for iOS and Android, allows access to your Firm Central Time & Billing information wherever you have your mobile device. For many legal professionals, having their work potentially following them everywhere they go may not sound ideal. However, in today’s legal landscape you don’t have much choice. Client expectations have changed and being more accessible to your clients is crucial for client satisfaction. Consider the ability to talk to a customer and track time simultaneously on your cellphone with the use of the Firm Central Time & Billing mobile short-cut. In this scenario, not only are you providing great service, but also saving and tracking your time. Furthermore, how often do you bill time for client matters when you’re not in the office? Or incur costs for those matters? Instead of making notes about these time expenses or costs, and then remembering to enter them into your invoicing system the next time that you’re in the office, wouldn’t it save time to just enter expenses into your system as you incur them? Likewise, it saves time to generate an invoice right when a client asks for it, rather than adding the task to the pile waiting for you when you get back to the office – taking time away from doing the work that keeps the lights on. If yours is one of the many businesses that use QuickBooks, you’ll need to reconcile the numbers between your QuickBooks account and your law firm time-keeping and invoicing platform. This can be a highly time-consuming process, depending on the platform’s compatibility with QuickBooks. If you are using Firm Central Time & Billing, the time investment will be at the absolute minimum. Firm Central allows you to sync your QuickBook accounts directly so that any new or updated information from Firm Central is pushed to your QuickBooks account. This feature essentially reduces any operational friction between the two systems to virtually zero – and this, in turn, frees up a lot of time that would otherwise need to be spent bridging the gap to regularly transfer data. Moreover, the rest of the features mentioned above free up time that would otherwise be spent on unbillable time and invoicing matters – thus saving money for your practice.